The MA-9 site on the asteroid Ryugu, where the Hayabusa2 spacecraft's MASCOT lander will touch down on Oct. 3, 2018. We now know where a Japanese asteroid-sampling probe's lander will touch down this October. The Hayabusa2 spacecraft's Mobile Asteroid Surface Scout (MASCOT) will land at a site in the asteroid Ryugu's southern hemisphere dubbed MA-9, mission officials announced today (Aug. 23). 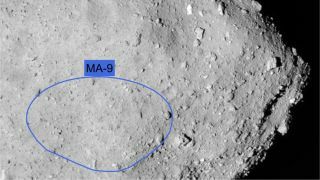 MA-9 and a few other landing site targets on the asteroid Ryugu. MA-9 features relatively fresh, pristine surface material that hasn't been exposed to cosmic radiation for long compared to other parts of the 3,000-foot-wide (950 meters) asteroid, team members said. And Hayabusa2 will drop three small rovers onto patches of the space rock's northern hemisphere, so a southern site for the 22-lb. (10 kilograms) MASCOT will give the mission greater coverage of the space rock, they added. In addition, MA-9 isn't quite as boulder-studded as most other Ryugu regions. That doesn't mean landing there will be a breeze on Oct. 3, however. A close-up look at the sites L07, L08 and M04 on the asteroid Ryugu. "But we are also aware: There seem to be large boulders across most of Ryugu's surface and barely [any] surfaces with flat regolith," Ho added. "Although scientifically very interesting, this is also a challenge for a small lander and for sampling." The $150 million Hayabusa2 mission launched in December 2014 and arrived at Ryugu on June 27 of this year. If all goes according to plan, the spacecraft will study the big asteroid from orbit for another 16 months and also drop down several times to grab samples of Ryugu material. The Hayabusa2 orbiter is scheduled to depart from Ryugu in December 2019. The capsule containing the mission's asteroid samples will come down to Earth a year later, in December 2020. This image of the asteroid Ryugu was taken by Japan's Hayabusa2 probe on June 26, 2018, just one day before the spacecraft's arrival at the big rock. Hayabusa2 isn't the only asteroid-sampling project underway. NASA's $800 million OSIRIS-REx (Origins, Spectral Interpretation, Resource Identification, Security, Regolith Explorer) mission is on its final approach toward the asteroid Bennu, and should arrive in orbit around the 1,650-foot-wide (500 m) rock this December. OSIRIS-REx's samples are due to land on Earth in September 2023. Both Hayabusa2 and OSIRIS-REx aim to help scientists better understand asteroid composition and structure, the early history and evolution of the solar system, and the role space rocks may have played in helping life get a start on Earth. Bringing pristine samples of asteroid material back to Earth will allow researchers to tackle such questions efficiently and effectively, team members from both missions have said. Scientists can perform many more experiments and investigations using well-equipped labs around the world than a robotic probe could conduct all by itself in deep space.